1994 - Dash For The Ticket, chestnut QH colt out of Ms Dash for Dinero. Owned by Natasha Powers/Powers Farm, FL. 1997 - Dash For Tickets, palomino QH colt out of Ms Dash for Dinero. Owned by Natasha Powers/Powers Farm, FL. 2000 - Over The Hilltop, dark red chestnut QH colt out of Two Eyed Dancer. Owned by Natasha Powers/Powers Farm, FL. 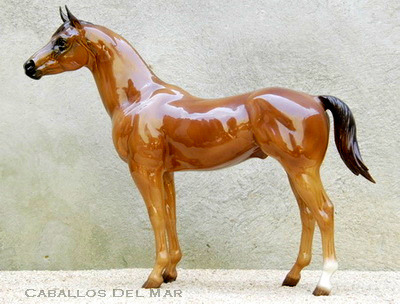 2003 - Double Hot, chestnut QH colt out of Hot Spark Express. Bred by Green Mountain Stables. 2007 - Hot Blue Cat, chestnut tobiano Paint Pony filly out of McCall's Blue Cat. Owned by Natasha Powers/Powers Farm, FL.